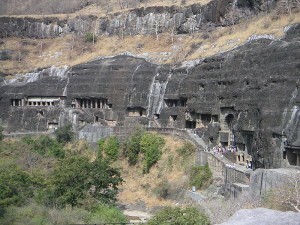 The thirty rock-hewn caves at Ajanta which are cut into the scrap of a cliff are Chaityas (Chapels) & Viharas (Monasteries). Most of these are carved so that a flood of natural light pours into them at any given time of the day. Both the facade and the inside of the chambers faithfully reproduce the structural patterns known to those ancient builders. On the walls are paintings many still glowing with their original colors. The outer walls are covered with brilliantly executed sculpture. The ajanta caves are not numbered in chronological order. Cave nos. 9, 10, 12, 13 are the earliest belonging to Hinayana Sect of Buddhism. Cave no. 1 to 30 is the Chaityas and rests of them are Viharas. The most notable of all these caves are 1,2,9,10,16,17,19 and 26, here ancient Indian art attained the zenith of its development and revealed a dynamic rhythm of life. Air:The nearest airport Aurangabad is 106 km from Ajanta. Rail:The nearest railhead Jalgaon is 60 km from Ajanta, however Aurangabad (106 km) is the most convenient railhead. This entry was posted in Ajanta, Maharashtra and tagged ajanta, ajanta and ellora, Ajanta Caves, ajanta ellora. Bookmark the permalink.